I wasn’t too sure what to expect upon arriving in Cambodia. I knew that it was a developing country with a poor education system, but I did not know much about the people or history here. On the flight to Cambodia, I decided to educate myself a bit more about the history of Cambodia by watching First They Killed My Father, a historical memoir film that depicts a young Khmer girl who was forced to train as a soldier under the Khmer Rouge around the time of the Vietnam War. Knowing that history helped me understand why Cambodia is in the place it is in now in 2018. Something that was surprising to me was driving here. Most locals get around in Cambodia on motorcycles, and there are usually 2-3 people seated on the motorcycle. Multiple times, I’ve seen an adult driving the motorcycle with one kid in front of him and one behind. There are also a dozen tuktuks, or Cambodian taxis, on every street — they mostly target tourists. The first full night here in Cambodia, I was asked more than 20 times if I wanted a tuktuk. These drivers will sometimes shout across the street if they see that my classmates and I are walking. The streets are also pretty narrow compared to the wide lanes in Irvine; there’s essentially just one big lane, but people know which side of the street should drive which direction. There are barely any traffic lights, so the flow of traffic is constant. On top of that, there are no crosswalks, so people are just jaywalking across the streets all the time. To make turns, they use hand signals and sometimes drivers will fit through tight corners just to make the turn. Surprisingly, I have only seen one accident in the week I’ve been here. Traffic aside, what has been the most surprising to me in Cambodia are the people. To start, the Cambodian people are so friendly, kind and respectful. They always smile and greet us whenever we walk past them. The teachers we work with at Treak Community Centre (TCC) are very kind and helpful to us in answering any of our questions about Cambodian culture and sharing about their life to make us feel more comfortable. Cambodian culture also emphasizes respect. They have a specific way of greeting and showing respect to another person called sampeah. They put their palms together, starting at their chest for friends and equals and moving their palms higher towards the head as the status of the other person increases. But what I have observed, above all these characteristics, is that Cambodians are extremely hard working and strong willed. 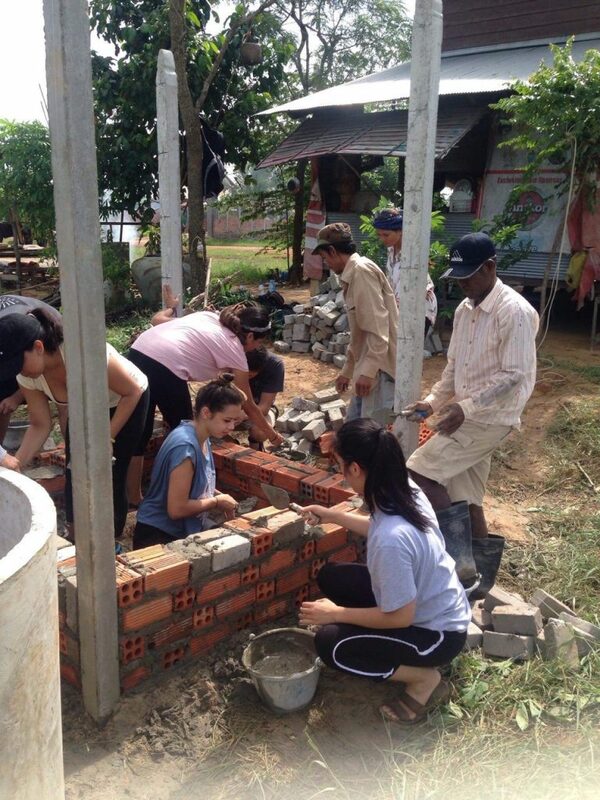 Our first week here consisted of making bricks to build a toilet for a family in the village in the morning. While we were working on building the toilet, there were three other Cambodian men who had started on the toilet before we arrived. It was muddy and grassy, and the men would walk barefoot through all of it, pushing and carrying the materials needed to build the toilet without even breaking a sweat in 90 degree F heat with 98 percent humidity. It is really hard and laborious work, but they make it look so effortless, and they do not complain at all when they’re doing it. On another occasion, our site director at TCC asked a couple of my classmates to help her fill up big holes on the roads with sand and pebbles. When I had left for lunch, I saw her and some of my other classmates shoveling away. When I came back from lunch an hour and a half later, she was still shoveling and had covered almost 80 percent of the hole. Seeing all the hard labor that goes into being able to have a toilet to use or safe roads to drive on reminded me to be more grateful for the privilege I experience in America. I have so much respect for the Cambodian people here and I hope to learn from their resilience and work ethic and show more gratitude for everything I have in my life.